I am a gin girl through and through. It started when I fell out of love with vodka early in college and quickly rebound to the next clear liquor in line, gin. With low expectations, I didn’t expect more than a one or two month fling with gin.... But I fell hard for the complex, botanical spirit and haven’t wavered since! For those who already love gin, I am about to share with you my latest discovery of the BEST UNDER-THE-RADAR GIN. Note: If you hate gin due to some tragic night in college or have never tried it, stick with me because the cocktail recipes below might just change your mind / life. I discovered Gin Lane 1751 while flipping through Instagram one day. I paused when I saw what I thought was a fancy rosé bottle. I looked closer and the word GIN jumped out at me. I immediately researched the mysterious pink gin and discovered the distiller, Gin Lane 1751. How does this beautiful Victorian gin get it’s pink hue? Bitter aromatics of course! I was in disbelief. Had Gin Lane 1751 read my mind? I always drink gin with soda and Peychaud's bitters. I knew I had to try this magical mysterious gin. 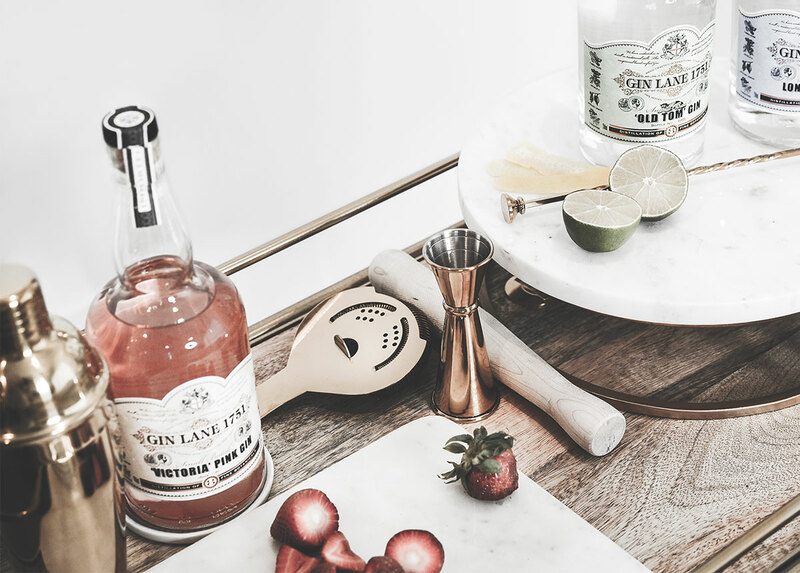 Thankfully, you can buy all four varietals of Gin Lane 1751 online – so I swiftly purchased the Victorian Pink Gin and it arrived on my doorstep within the week. So now you know. It’s a pretty exciting discovery if you’re a gin fanatic like myself, am I right? If not, I urge you to give one of the two (or both) summer cocktail recipes below a try. The Strawberry Cooler cocktail might as well be a strawberry bomb infused with booze. I love that the recipe calls for only 3 ingredients and no-added sugar! It's a ridiculously good and dare I say, healthy cocktail. The second drink, the Gin Lane Rickey, is where the aromatic pink gin takes center stage. A no-nonsense cocktail recipe that uses simple ingredients to brighten and enhance the gin's natural botanical flavors. Talk about refreshing, too! Pick your magic below and let me know your thoughts! Muddle the strawberries in the base of a cocktail shaker. Add remaining ingredients, fill with ice and shake vigorously. Strain into a ice filled highball glass and garnish with a strawberry. Fill glass with ice. Add Gin Lane 1751 'Victoria' Pink, lime juice and sugar. Stir vigorously and add Club Soda/Seltzer.